Control Solutions LLC (CSLLC) has established the following procedure to provide customers with the best possible support and shortest repair turnaround time. This procedure applies to products both in and out of warranty. 2. We will then reply to you via e-mail and phone with your approved RMA number. Our quality/operations group will match your request against the Product Tracking System to determine if the product is under warranty. This process usually takes 1-2 working days. Do not return your product(s)until you have received an RMA number. If it is determined that your product is not covered under warranty, you will be notified of the cost to repair your product. If you want to proceed with that repair, please click the link below that will take you to a safe, secure way of paying for that repair via credit card. This will speed up the repair process; or you can send us a check. To make a payment, please enter the amount below, then click "Next". You will be redirected to PayPal for secured processing. Once you have received a RMA number, please note it on all your documentation. Then, package the authorized product(s) using commercially acceptable material and packing methods. Multiple items for a single RMA should be packaged in the same box. Please do not include items for multiple RMAs in the same box. Print out the following packing slip and shipping label and include it in your shipment. Attach the shipping label to the package. Mail your return using a traceable ground shipping method (e.g., United Parcel Service (UPS), Federal Express, DHL, or other freight companies). You will be notified when we receive your RMA package and initial triage has been performed. You, the customer, pays and arranges for all inbound shipments to Control Solutions, regardless if the product is under warranty or not. Please insure your part shipment as we are not responsible for damage during this shipment. Return shipping from Control Solutions will be surface/ground freight unless specifically requested by you. If special requirements and/or expedited shipment are required this will be added to any repair expenses. CSLLC will inspect the RMA shipment when it arrives. If it is damaged, CSLLC will notify you immediately. It is then your responsibility to initiate a claims inspection with your shipping company. Upon receipt of the defective product(s), CSLLC will inspect, diagnose and, if under warranty, repair or replace the product(s). If defective units are out of warranty, repair charges may apply. 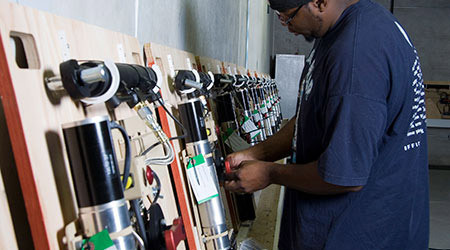 When units are repaired they are restored to the manufacturer’s original operating specifications. CSLLC reserves the right to refuse repair. If the customer wishes to have the product in question returned, it is at the your expense. CSLLC will impose an up charge for the removal of post-factory installed devices attached to a product that impede the repair of the product. Examples include labels, mounting brackets, fasteners, and tape. CSLLC strives to maintain an average repair interval of ten (10) business days, but makes no guarantees regarding the period of in-house repair time. It is CSLLC’s policy to perform hardware and software upgrades to the latest revision level (where applicable and practical) free of charge for in-warranty product returns – unless the upgrade is due to a customer requested change. CSLLC provides a 48-hour rush service to expedite repair of specific unit(s). Rush unit(s) will be prioritized and will be guaranteed to ship on the second business day after notification is provided to CSLLC and returned components/unit(s) have been received. If an item is part of a previous shipment CSLLC received, contact CSLLC to locate the item and attempt to process it as a “Rush”. An Expedite fee will be assessed per unit in addition to customary repair charges. CSLLC will only guarantee up to three (3) Rush units per customer per day.